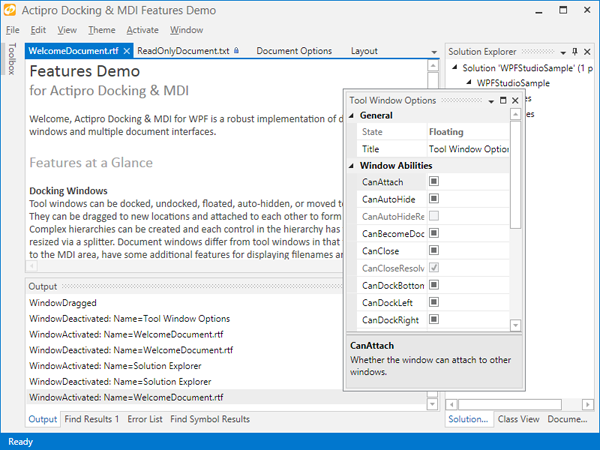 Our WPF Docking/MDI product, which provides docking tool window and multiple document interface functionality for WPF applications, is already about the most polished and full-featured product of its type on the market for the WPF platform. It supports multiple professional themes, complex hierarchies of tool windows, auto-hide, multiple MDI modes, Prism/MVVM support, nested and side-by-side dock sites, layout serialization and much more. As great of a product as it is, there are a few areas we are possibly looking to improve and make the product even better. Some of this may involve a refactoring of a lot of internal code, and as such, we wanted to come to you our users and get some feedback on what improvements you would like to see made. The feedback could be anything from simple UI and docking functionality ideas to suggestions on improving interaction with our API. For instance, perhaps you would like to see "pin" buttons added to tabbed documents, which is a newer feature found in Visual Studio 2013. We would love to hear what you would like to see implemented in our WPF Docking/MDI product that isn't already in place today. Please send your comments and thoughts to our support address with as much detail as possible and screenshots/mockups where appropriate. A very nice touch would be an animation when rearranging tabs, like Google Chrome has. I'm so used to it now that when I move a tab in my Actipro application, it feels "stiff". Great suggestion Jim. That is something we want to look into to give it a more modern feel. Hi Bander, SyntaxEditor already does have VS-like member list and completion features, but if I am misunderstanding what you are referring to, please email our support address with some screenshots. This particular blog post is looking for suggestions to our Docking/MDI product only. For suggestions on other products, please email our support address directly. Thanks! A few things that would be nice: 1) ability to specify standard width tabs with sizes that don't change when closing tabs until you move mouse away (like chrome). This makes it easy to rapidly close a collection of tabs 2) An easier or built-in way to override the order in which tabs are opened/displayed (when using MVVM pattern). For example, do new tabs show up on left or right? What happens on overflow. It would be great if you just provided a policy object, a few properties, or a few behaviors to control this. Three or Four options would cover 90% of scenarios. 3) A "preview" tab like in VS 2013 along with all the feature that includes. 4) Better support for undocked tabs having their own docking areas (again, see VS 2013) 5) Support for tab pinning. 6) Better support in serialization of document layout state when MVVM pattern is used. There are a whole bunch of things that don't save correctly. Email me if you need more details. 7) Pre-built behaviors to better manage focus issues. We've built some of these ourselves, but it would be great to get them off our plate. 8) A general purpose document manager class that handled recent items, serialization of open document windows with layout, etc. The functionality you have now does not work super well with MVVM pattern. 9) Better support for windows that are intended to be always floating, such as Find/Replace. An example of improvement would be windows that snap to the size of their contents when opened. 10) Modernize default styling of the switcher control. 11) If you want to innovate in this space, you could also think about adding features to make tool windows easier to use with touch. This would probably take the form of a hover or tap to expand the sizes of the tabs to make them more finger friendly. But I admit I haven't thought much about how it would work in practice. Hi Scott, Great ideas! We already have a number of them on our goals list, but would like to get some more info from you specifically on #2, #6, #7, and #8. Could you email our support address with more detail on those? For #9, we currently have a method you can programmatically call to raft a docking window and have it snap to its desired size, but it sounds like you want that handled automatically? In your email, please include any other notes on that. Thanks! To and my company the most important feature is UI tests. I've already spoken about this to Bill and this is the only thing that is currently stopping me and my company from buying the control. All the other feature are secondary to us. Thanks! Hi Eric, So far in the early prototypes, clicking on tool window tabs and typing in their child TextBox controls is working ok for us in coded UI tests.